Sunday brought another glorious day of sunshine and low 70s. Perfect weather for exploring the island so we set off early after breakfast for the trails. A staircase behind the Harbour View Inn led us up to the East Bluff where we walked along amazing cottages that overlooked Lake Huron. We then cut along a few trails that took us to Mackinac Island State Park, which was once a national park, then became the first state park in 1895 and believed to be the first state-operated park in the nation. Along the trail we came to Arch Rock, which towers 146 feet above the water below. Native American lore tells that the arch in the rock was made by tears from an Indian maiden who was forbidden by her father to see the man she loved, a young brave who was the son of a sky spirit. Eventually the brave returned to her and they went to the home of his sky people. We encountered several horse-drawn carriages (so fun to see!) as walked down the park roads. Sugar Loaf was soon on our right – the island’s largest limestone formation stands 75 feet high. It once was an island when lakes covered the area centuries ago! Next, we climbed a staircase that took us to Point Lookout, the highest point on the island. After a brief rest to reapply sunscreen and hydrate, we took off for Post Cemetery. On our way there, we passed the one-million gallon island water reservoir (which isn’t very spectacular since it’s covered with grass/weeds). Guess they don’t worry about people messing with the water source. Walking through Post Cemetery, you can’t help but be reminded of the sacrifices made every day by thousands of troops on our behalf, serving to protect our country, friends and family. I’m always humbled by those thoughts. 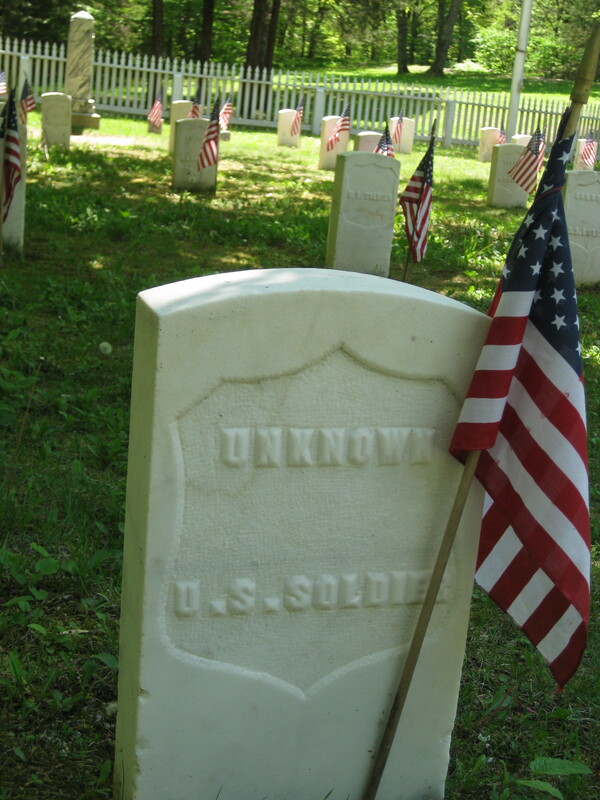 This cemetery dates back to the mid-1820s and contains about 108 burials, mostly military. Interestingly, most of the grave stones are marked “unknown” so this is one of only four cemeteries in the U.S. that always flies the American flag at half-mast. at high ground overlooking Fort Mackinac. The Americans, taken by surprise and unable to defend themselves, surrendered. The view from Fort Holmes is awesome, with Lake Huron, Fort Mackinac, the Grand Hotel and more in view. After lunch on the balcony of our hotel, we took off for Lake Shore Blvd. Passing through downtown, we soon came across a marker for the movie “Somewhere In Time,” which was filmed on the island, starring Christopher Reeves (Superman!) and Jane Seymour. We were silly and re-enacted the pose (encouraged by two women who loved the movie) and then headed to Pontiac’s Lookout. We climbed a LOT of steps to reach West Bluff, where we encountered more beautiful views and cottages. Since 80 percent of the island is state-owned (as the park), most of the cottages are built on land leased from the state. New leases were stopped in 1920 so while many cottages have modern updates, the old architecture styles are evident. 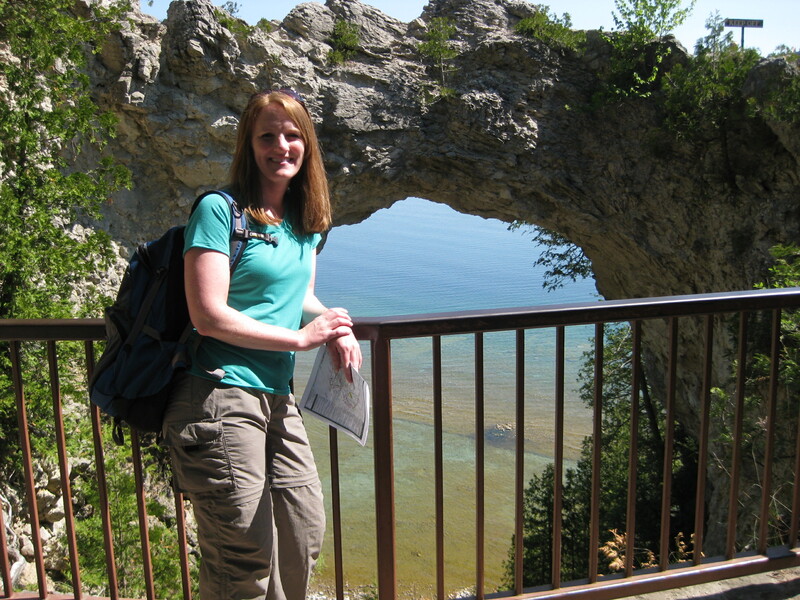 After enjoying a view of Mackinac Bridge, we hiked along some trails to view more cottages then headed back toward town, cutting through the subdivision where most locals live year-round and around the golf course. We ended the day with a nice dinner, splurged on chocolate covered pretzel rods and a walk through town. As we boarded the ferry for Mackinaw City on Monday, I felt relaxed and a little bummed to be leaving the solitude of Mackinac Island. So I’ll focus on the next adventure…wherever that may lead me…..